So, Daredevil: Road Warrior #2 comes out tomorrow! I could really get used to this getting Daredevil once a week deal. For now, though, let’s make a very quick stop to look at a panel from Daredevil #71, by Roy Thomas (his last) and Gene Colan. Gene Colan was a freaking genius, as we all know, but apparently, even geniuses can have an off day. Before suggesting something outrageous like that though, I want to remind readers of that one time I suggested that Gene Colan had given Karen an extra finger. That turned out to just be a case of me looking at it all wrong (see the comment section of that post). This may be yet another case of the very same thing, though I think I’m actually right this time. The third panel on the right, when compared to the middle one, just looks wrong. So what’s going on here? Matt, worried they’ll be late for court, checks his watch (which, despite lacking a few dots here and there, looks like a pretty accurate braille watch). In the middle panel, the tip of his finger covers almost the entire face of the watch. In the panel on the right, however, the watch looks like it’s grown to about three times its orginal size. And move up to Matt’s elbow. And don’t his fingers look like they are at a very odd angle relative each other? Or is he feeling the hands of the watch with his ring and index fingers and the middle finger is somehow missing? I can’t make sense of it. Am I looking at this all wrong or did Gene Colan really have a case of the mondays? You tell me! Gene was merely giving the watch face its “I’m ready for my close up, Mr. DeMille” moment. Yes, I think in trying to show how reading the watch would work, he decreased the size of the fingers so they wouldn’t be in the way. Unfortunately, it made the watch and arm in comparison look HUGE. I couldn’t help but chuckle quite a bit when I read this post. It’s funny how sometimes we disect the silliest things, isn’t it? But, I don’t think that the watch moved up to his elbow. I think what you’re seeing is a closeup of his wrist, kind of turned outwardly. And I don’t think that the watch grew, because it seems correct ont he scale of the wrist, I just think that the fingers were added in and made quite a bit too small. the artist was likely trying to make a point of the gesture of feeling the hands of the watch-face, and paid more attention to that than the actual scale. But, I couldn’t help but get a kick out of this! Matt is wearing-the-watch-on/reading-the-watch-with the same wrist/hand! 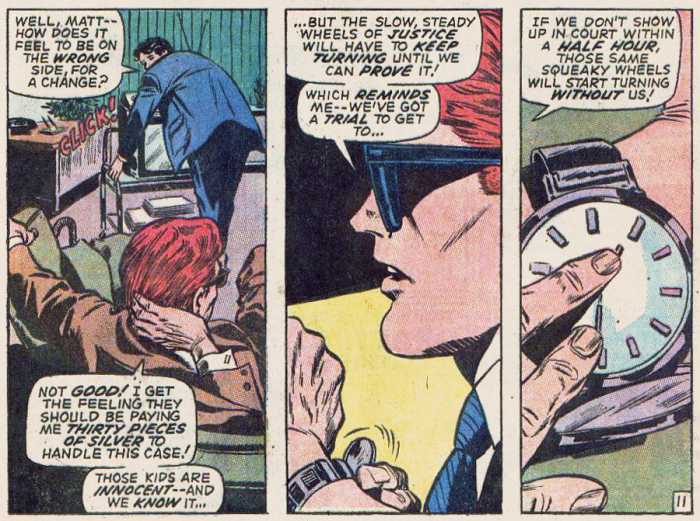 In the second panel, the watch is clearly on Matt’s left wrist; then, in the third panel, we get a close-up of that same (left) wrist… and yet, Matt is reading the watch with his left fingers! PS: This scene is made all the more sublimely humorous when one considers that Foggy starts the conversation with a crack about Matt being “on the wrong side”!